Although he was just 178 centimetres tall and 80 kilograms, James Henry (Jim) Jones played seven of his 15 senior games for Carlton at full-back, in a career interrupted by four years of service with the Australian Army and the RAAF during World War II. Recruited from Ouyen in northern Victoria, Jim arrived at Princes Park in 1937 and made his presence felt almost immediately with a notable game for Carlton Reserves on the King's Birthday holiday Monday. In a remarkable match, Carlton trailed Richmond at half-time, before piling on 13 goals to one in the second half to win easily. Jones kicked 7 goals - 6 of them in a brilliant third quarter blitz. However, the depth of Carlton's list at that time meant that he wasn't promoted to the senior team until round 10, 1939, when the Blues met St Kilda at the Junction Oval. Wearing guernsey number 22, Jim started the match in a forward pocket, but was hardly sighted as the Blues suffered a five-goal loss to the improving Saints. He managed only two more senior games that year – both as a reserve – as Carlton faded out of finals contention late in the season, and wound up in fifth place on the VFL ladder. Even as those '39 finals began, Australia was plunging toward alarm and uncertainty in the wake of our government’s declaration of war against Germany. Within days, recruiting centres were set up in every town and city, and young men in their thousands flocked to volunteer to fight for their country. 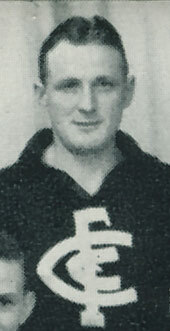 Jones spent most of another season at Princes Park (playing six more matches at senior level, and kicking his only career goal against Hawthorn in round 10) before he too signed up to fight in August, 1940. Within weeks Jim was undergoing basic training, only to realise that foot-slogging wasn’t for him. He applied for a transfer to the RAAF, and after less than six months in khaki, was able to swap to air force blue. He then had to wait many more months before being accepted for pilot training. In early 1945, with the end of hostilities in sight, Jim returned to Princes Park after four full seasons away. By coincidence, Carlton’s 22 guernsey had recently become available again. It had been worn in Jones’ absence by Arthur Sleith, Ron Boys, Bert Lucas and Les Gregory – each for only a few games. Jim claimed it back, and gained himself a place in Carlton’s team for the first round of the ‘45 season – at full-back - against Melbourne at Princes Park. The Demons handed Carlton a 21-point defeat, but much worse was to follow. At Windy Hill in round three, Essendon made history when they slaughtered Carlton by exactly 100 points – the first time that our proud club had ever been defeated by a three-figure margin. Naturally, a number of players paid for that defeat, including Jones. He was omitted from the side for the following week, and wasn’t considered again all season. Meanwhile, the Blues slowly gelled as a team, and went on to a magnificent victory over South Melbourne in the infamous ‘Bloodbath’ Grand Final. Perhaps many players would have taken that sequence of events as a strong hint that their days as a league footballer were numbered – but not Jim Jones. He soldiered on into 1946, and to his credit, was selected again at full-back in four of the first five matches of the year. The last of these was a bruising, torrid battle against North Melbourne at Princes Park in late May. Carlton won by 16 points, with another returned serviceman in Ollie Grieve starring in defence for the Blues. Although that had been a gutsy win, Jimmy was left out the side for round 6, and never played for Carlton seniors again. Instead, Ollie Grieve took over as the Blues’ custodian of the goal square from then on, and began building a stellar career as one of Carlton’s greatest full-backs. Pilot Officer Jim Jones R.A.A.F. in 1944. Jim would have been an instructor in Canada as part of the Empire Air Training Scheme (E.A.T.S.) which trained more than 130,000 personal as pilots, navigators, gunners, wireless operators, bomb aimers, and flight engineers for various Commonwealth air forces during WW2. Contributors to this page: blueycarlton , molsey , pblue , PatsFitztrick , tmd1 , WillowBlue , Jarusa and admin . Page last modified on Wednesday 19 of December, 2012 15:47:24 AEDT by blueycarlton. WEG GF Poster - 1995 GF Greg Williams.